Whether you are a pumpkin fan or not this Fall, Captain Morgan has the perfect party drink and/or shots drink for you! For all the pumpkin flavor lovers out there, this fall season, Captain Morgan is spicing up the shots category again with a new limited edition pumpkin spiced rum. Jack-O’Blast is a fall-inspired product that blends Caribbean rum with everyone’s favorite seasonal flavors – including fresh pumpkin, cinnamon and other autumnal spices. The first pumpkin spiced rum to ever hit shelves, Jack-O’Blast is best enjoyed as a chilled shot but can also be served as a drop shot or in a number of fall drink recipes. Your obsession with pumpkin is no longer limited to the standard pumpkin beer and pumpkin spiced lattes this season. Captain Morgan Jack-O’Blast is a must-have for responsible adult consumers during their favorite seasonal activities, whether it’s at football tailgates, Halloween parties or backyard bonfires with friends. 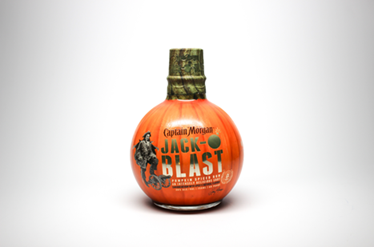 While Captain Morgan Jack-O’Blast boasts the identical shape of its predecessor, Captain Morgan Cannon Blast, it features autumn colors of orange and green. To solidify its place as fall’s must-have shot, the bold, round bottle simulates the look of a carved pumpkin when illuminated under a black light. And for all you people who aren't pumpkin fans, Cannon Blast is an intensely delicious shot that is citrus sweet with a spark of heat! The sweet citrus delivers a pleasing and delicious front end while providing a finish with a warming sensation! NOT into SHOTS?? Don't worry - you won't be disappointed in using Cannon Blast or Jack-O'Blast in one of your favorite cocktails either! You can purchase the Cannon Blast and Jack-O'Blast (60 proof, 30% ABV) for a suggested retail price of $15.99 for a 750 ml bottle and the Jack-O'Blast is currently available nationwide for a limited time this fall. I actually bought a couple bottles of Captain Morgan Jack-O’Blast in October. I like how it tastes. And the pumpkin shape is pretty impressive too.